The Aggregate Landscape of Somerset: Predicting the Archaeological Resource was commissioned by English Heritage in 2005 and represents a survey of the archaeological resource of the aggregate mineral producing areas within the County of Somerset. The project was funded through the Aggregates Levy Sustainability Fund (ALSF), which was introduced in 2002 to attend to issues arising from the extraction of aggregates. The project comprises of a largely HER based assessment of the archaeological resource within six character areas of past and current aggregate extraction within the County of Somerset. 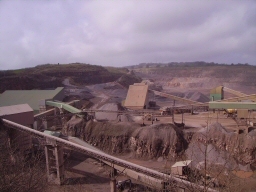 Included in these areas is a consideration of regions identified as possible future sources for aggregates from the Somerset Minerals Local Plan (MLP). The project also included a pilot aerial survey of two areas on the Eastern Mendip Hills and the Westonzoyland and Chedzoy Burtle Beds on the Somerset Levels. The results of the Resource Assessment have established that approximately 25% of the archaeological resource within Somerset lies within areas suitable for aggregate extraction including 28% of the County's prehistoric monuments, 11% of the Roman, 14% of the Early Medieval, 14% of the Medieval and 29% of the Post Medieval monuments within Somerset. The Resource Assessment also highlighted a general dearth across all the character areas for good quality modern archaeological excavations; geophysical prospection, environmental surveys, artefact studies and scientific dating. The Research and Outreach Agendas propose areas for future study and re-assessment in particular focussing on a number of monuments severely impacted on or destroyed by aggregate extraction that have hitherto been poorly investigated. The results of the two pilot aerial photographic surveys centred on the Eastern Mendip Hills and the Westonzoyland and Chedzoy area of the Burtle Beds created a total of ninety-eight new Somerset HER records and amended sixty. On the Mendips sixty-five new records were created and twenty were amended, the majority relating to Medieval and Post Medieval agricultural practice. For the Burtle Beds thirty-three new records were created and forty were amended, many of which related to the Prehistoric and Post Medieval periods. Of particular interest within the Burtle Beds pilot area numerous areas of Medieval or Post Medieval sand extraction were identified.